You do not have to settle for less to get the best price for a storage container in Las Vegas, Nevada! Haulaway Storage Containers provides a superior product with great customer service, but we also strive to maintain competitive pricing. We know that keeping costs down is an important part of serving our customers. Rent a storage container from us with confidence that you are getting a durable, high quality, and secure affordable storage container at the best possible pricing. Haulaway goes beyond door to door service – we don’t just deliver to your job site or property, we will place your storage containers in any accessible location. And when your job is completed, we offer prompt pick up. 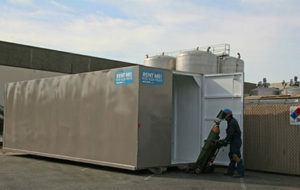 One call to Haulaway Storage Containers does it all for all your short and long term exterior storage needs. Of course, the best price for a storage container is not the only consideration when selecting a storage container provider in the Las Vegas area. Selection is also very important, as is quality. Haulaway Storage Containers offers temporary storage containers is lengths ranging from a convenient 10 feet to a capacious 40 feet, and many sizes in between. Whether you job is big or small, Haulaway has it all. You can rent a storage container from us with confidence, knowing that it will perfectly fit your needs. Haulaway is able to provide the best price for our storage container selection at our location at 4880 East Carey Avenue in Las Vegas, Nevada. This central location allows us to serve the greater Las Vegas area while minimizing transport costs. In addition, we have another Nevada location in Reno, as well as locations throughout the Western United States. This allows us to offer a wider selection of storage containers at lower overhead, and we pass the savings along to our valued customers. Give us a call or browse our extensive website to get started today. We look forward to helping you make your project a success.